In a hurry? Need manners in minutes? 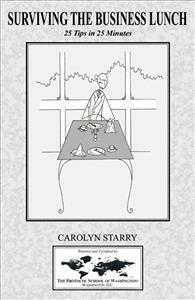 Surviving the Business Lunch: 25 Tips in 25 Minutes written by Carolyn Starry, graduate of the Protocol School of Washington® is a must read for anyone climbing the corporate ladder. As the days of casual business practices come to an end, many in corporate America find themselves unaware of formal business behavior. From business dress to formal correspondence to dining, today’s businessperson must know how to properly present him or herself. Career-oriented people realize that knowledge of proper etiquette is an important asset. Surviving the Business lunch: 25 Tips in 25 Minutes covers how to be a savvy guest by taking you from accepting the invitation to writing a “thank you” note and every step in between. A must read for anyone climbing the corporate ladder.